VANCOUVER, July 27, 2017 /CNW/ - NexGen Energy Ltd. ("NexGen" or the "Company") (TSX:NXE, NYSE:NXE) is pleased to report a new uranium discovery during our on-going summer drilling program on our 100% owned, Rook I property, Athabasca Basin, Saskatchewan. The first two exploration holes of the summer drill program have resulted in the discovery of a new zone of off-scale radioactivity approximately 400 m south of the Arrow Deposit. This new area of mineralization has been named the South Arrow Discovery and is located on an Arrow-parallel structure that remains almost completely undrilled. The Arrow South Discovery is currently defined by the local occurrence of narrow massive pitchblende veining measuring >61,000 cps. The South Arrow Discovery has been tested with only two holes and both intersected narrow intervals of off-scale radioactivity within a large and robust envelope of highly prospective hydrothermal alteration. South Arrow remains open in all directions. Highly Radioactive - Mineralization is locally very strong observed as dense massive pitchblende veins. Intermittent anomalous uranium-sourced radioactivity occurs over core lengths of up to 400 m, which supports that a large and robust uraniferous alteration system is present at South Arrow. Multiple lenses - Preliminary interpretations at South Arrow suggest that steeply southeast dipping mineralization occurs within at least three stacked high strain or sheared intervals, which is a common characteristic of the Arrow Deposit. Extensive Alteration - Similarly to Arrow, the hydrothermal alteration is widespread, which suggests a strong mineralizing event has occurred. Dravite and illite breccias are observed at the Arrow Deposit and the South Arrow zone. Discovery hole AR-17-151c1 intersected 7.0 m of total composite mineralization including 0.45 m of off-scale radioactivity (>10,000 to >61,000 cps) marked by narrow massive pitchblende veining. Follow-up hole AR-17-151c2 which targeted mineralization 25 m down-dip from the discovery hole, intersected 7.0 m of total composite mineralization including 0.2 m of off-scale radioactivity (>10,000 cps to 20,000 cps). South Arrow was targeted as a follow up to the mineralization and extensive hydrothermal alteration intersected in holes AR-17-150 and -150w1 (previously referred to as RK-17-118 and -118w1, respectively - see news release dated June 7, 2017). A seven-rig summer development and exploration program comprising a minimum of 25,000 m of drilling and multiple pre-feasibility staged technical studies is underway. A maiden Preliminary Economic Assessment is imminently scheduled. The Company has cash on hand of approximately $200 million. A map showing drill hole locations is shown in Figure 1. An isometric view of the Arrow and South Arrow 3D resistivity anomalies is shown in Figure 2. 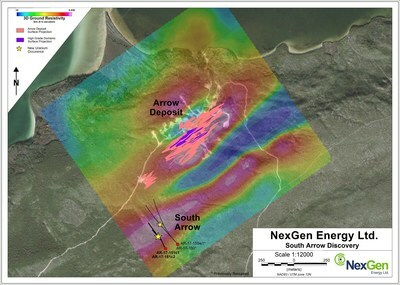 Garrett Ainsworth, Vice-President, Exploration and Development, commented: "The discovery of South Arrow is the result of a disciplined process by the team where multiple geophysical datasets were integrated to prioritize exploration targets. The ground 3D resistivity survey conducted by Dias Geophysical was key in elevating South Arrow as a high priority target that has now returned off-scale radioactivity associated with a large and robust alteration system. The alteration package is similar to that which accompanies the Arrow Deposit, and includes favourable dravite/illite/sudoite clays as pervasive and replacement, pervasive strong hematite, and intense silicification that includes radiation damaged quartz." Leigh Curyer, Chief Executive Officer, commented: "This is a very exciting time for the Company with the release of the maiden PEA imminent and today's drill results strongly indicating Arrow is still very much in its infancy in terms of exploration work conducted. As a consequence, additional drilling focus will be immediately directed to Arrow South whilst continuing to focus on high value targets in and around Arrow together with the engineering and environmental studies. I would like to take the opportunity to congratulate the entire NexGen team on another outstanding development for the Company and its shareholders." The Arrow South Discovery occurs within an Arrow-parallel deformation zone first identified by re-processing of airborne VTEM survey data by Condor Consulting. Recently, a high-resolution ground 3D resistivity/IP survey was completed by Dias Geophysical over an area covering the Arrow Deposit and a portion of the newly identified structure. The survey showed a resistivity anomaly highly coincident with and immediately flanking the Arrow Deposit. The survey also identified an additional anomaly coincident with the Arrow-parallel deformation zone first highlighted by the VTEM data. This new resistivity anomaly, named the South Arrow anomaly, has strikingly similar characteristics to the Arrow anomaly. It has now been tested in four holes, two of which have intersected off-scale radioactivity and all of which intersected extensive zones of hydrothermal alteration and anomalous radioactivity. Preliminary interpretations from structural measurements collected from oriented drill core suggest that the South Arrow mineralized bodies strike towards the southwest and dip steeply towards the southeast. All depths and intervals are meters downhole, true thicknesses are yet to be determined. Hole AR-17-151c1 was a directional hole collared from surface at an angled orientation (-70) to the northwest (327 azimuth). It was designed to test the South Arrow resistivity anomaly 75 m along strike to the southwest of holes AR-17-150 (formerly RK-17-118) and AR-17-150w1 (formerly RK-17-118w1). The hole intersected Athabasca Group sandstones between 99.4 m and the unconformity at 103.3 m. Basement lithologies consisted of semi-pelitic gneiss and orthogneiss of variable composition. Several broad deformation zones were encountered throughout. Extensive zones of hydrothermal alteration were also intersected which generally consist of replacement- and hydrothermal breccia-style clay, chlorite and silicification. The hole intersected visible disseminated, fracture-hosted and vein-style pitchblende mineralization in close association with deformation and hydrothermal alteration. A total composite mineralization of 7.0 m including 0.45 m of off-scale radioactivity (>10,000 to >61,000 cps) was intersected within a 45.5 m section (262.5 to 308.0 m) before the hole was terminated at 588.5 m.
Hole AR-17-151c2 was a directional hole that departed pilot hole AR-17-151c1 at 202 m. It was designed to test the South Arrow resistivity anomaly 25 m down-dip from the mineralization intersected in AR-17-151c1. Basement lithologies were intersected from the top of the hole that included semi-pelitic gneiss and orthogneiss of variable composition. Several broad deformation zones were encountered throughout. Extensive zones of hydrothermal alteration were also intersected which generally consisted of replacement- and hydrothermal breccia-style clay, chlorite and silicification. The hole intersected visible disseminated, fracture-hosted and worm-rock style pitchblende mineralization in close association with deformation and hydrothermal alteration. A total composite mineralization of 7.0 m including 0.20 m of off-scale radioactivity (>10,000 to 20,000 cps) was intersected within a 94.5 m section (310.5 to 405.0m) before the hole was terminated at 561.5 m.
NexGen owns a portfolio of highly prospective uranium exploration assets in the Athabasca Basin, Saskatchewan, Canada, including a 100% interest in Rook I, location of the Arrow Discovery in February 2014 and Bow Discovery in March 2015 and the Harpoon discovery in August 2016. The Arrow Deposit's second resource estimate, released only three years after the first discovery of mineralization, is 179.5 M lbs U3O8 contained in 1.18 M tonnes grading 6.88% U3O8 in the indicated category and an additional 122.1 M lbs U3O8 contained in 4.25 M tonnes grading 1.30% U3O8 in the inferred category. All scientific and technical information in this news release has been prepared by or reviewed and approved by Mr. Garrett Ainsworth, P.Geo., Vice President - Exploration & Development for NexGen. Mr. Ainsworth is a qualified person for the purposes of National Instrument 43-101 Standards of Disclosure for Mineral Projects ("NI 43-101"), and has verified the sampling, analytical, and test data underlying the information or opinions contained herein by reviewing original data certificates and monitoring all of the data collection protocols. For details of the Rook I Project including the quality assurance program and quality control measures applied and key assumptions, parameters and methods used to estimate the mineral resource set forth below please refer to the technical report entitled "Technical Report on the Rook 1 Property, Saskatchewan, Canada" dated effective March 31, 2017 (the "Rook 1 Technical Report") prepared by Mark B. Mathisen and David Ross, each of whom is a "qualified person" under NI 43-101. The Rook I Technical Report is available for review under the Company's profile on SEDAR at www.sedar.com. All intersections are downhole, true thicknesses are yet to be determined. The information contained herein contains "forward-looking statements" within the meaning of the United States Private Securities Litigation Reform Act of 1995 and "forward-looking information" within the meaning of applicable Canadian securities legislation. "Forward-looking information" includes, but is not limited to, statements with respect to the activities, events or developments that the Company expects or anticipates will or may occur in the future, including, without limitation, the completion of the technical report in support of the PEA. Generally, but not always, forward-looking information and statements can be identified by the use of words such as "plans", "expects", "is expected", "budget", "scheduled", "estimates", "forecasts", "intends", "anticipates", or "believes" or the negative connotation thereof or variations of such words and phrases or state that certain actions, events or results "may", "could", "would", "might" or "will be taken", "occur" or "be achieved" or the negative connotation thereof. Forward-looking information and statements also involve known and unknown risks and uncertainties and other factors, which may cause actual results, performances and achievements of NexGen to differ materially from any projections of results, performances and achievements of NexGen expressed or implied by such forward-looking information or statements, including, among others, negative operating cash flow and dependence on third party financing, uncertainty of the availability of additional financing, the risk that pending assay results will not confirm previously announced preliminary results, imprecision of mineral resource estimates, the appeal of alternate sources of energy and sustained low uranium prices, aboriginal title and consultation issues, exploration risks, reliance upon key management and other personnel, deficiencies in the Company's title to its properties, uninsurable risks, failure to manage conflicts of interest, failure to obtain or maintain required permits and licenses, changes in laws, regulations and policy, competition for resources and financing, specific risks relating to the negotiation and execution of the definitive agreements for the financing, the use of proceeds from the financing, the satisfaction of each party's obligations in accordance with the terms of the definitive agreements for the financing; failure to receive any required regulatory approvals (including stock exchange) or other approvals, and other factors discussed or referred to in the Company's Annual Information Form dated March 31, 2017 under "Risk Factors".